Warm up for Wordplaygrounds or just enjoy an amazing film on Wednesday, June 6 at 6:30 pm when the library will screen Louder Than a Bomb. 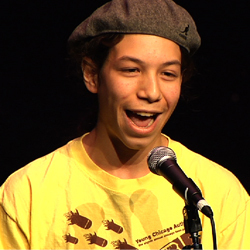 This exhilarating, award-winning documentary follows four teams of young poets as they prepare for the world’s largest youth poetry slam, which draws more than 600 teenagers from over 60 Chicago area schools. Roger Ebert named Louder Than a Bomb one of the ten best documentaries of 2011. The library’s event features an introduction by Glencoe’s own Bob Boone, whose writing program Young Chicago Authors sponsors Louder Than a Bomb. And once you've been inspired don't forget to sign up for Wordplaygrounds by June 11th! Wordplaygrounds is a four-week writing workshop for students ages 13 to 18, led by New Trier English teacher John O'Connor. It will meet on Tuesday and Thursday evenings from 7:00 to 8:30 from June 19th through July 12th. The focus will be on poetry, though short story writing will be encouraged as well. Last summer the program was a big hit so make sure you get signed up before it sells out! This month's Excerpts not only contains three months worth of the type of top-notch activities that you expect from the library but the look and feel of the newsletter is new and improved as well! We've expanded from six to eight pages, increased the font size, improved the layout and increased overall readability. Inside the new edition of Excerpts you will find information about presentations covering everything from Latin American artists to American rock and rollers, with stopovers at Millennium Park and Downton Abbey. You'll also find out about our Summer Reading Club and all your favorite kids programs, book groups, movie screenings and technology classes. You'll receive a print copy of Excerpts in your mailbox very soon but in the meantime you can access Excerpts online. The Glencoe Public Library will be closed on Sunday, May 27th and Monday, May 28th in observance of the Memorial Day holiday. We will reopen on Tuesday, the 28th. Have a great holiday! Sponsored by Family Service of Glencoe in partnership with the Glencoe Public Library, this free program will meet in the library's Hammond Room. All are welcome! Did you know that the Glencoe Public Library is not the only library in town? The Chicago Botanic Garden has a lovely special library that is a delight to explore. On the afternoon of Sunday, May 20, everyone with a Glencoe library card is invited to attend Glencoe Day and get acquainted with the the Botanic Garden's Lenhardt Library. Of course, the rest of the garden will be open for your enjoyment as well! From 2:00 to 4:00 p.m., visitors to the Lenhardt Library are invited to a gallery talk and library walk-through led by director Leora Siegel. You will have the opportunity to view and handle rare botanical books, browse the new “Rare Seeds” exhibit of rare books and works by contemporary artists, and learn about research opportunities online and in the library. A special children’s activity is planned as well. Take the green trolley directly from the library to the Botanic Garden at 1:30 p.m. at no charge. The trolley will bring riders back to Glencoe at 4:30 p.m. (drop-off is at the train station). If you prefer to drive, free parking is offered from 12 noon to 5:00 p.m. for Glencoe Public Library card holders. Admission to the garden is always free. A 10% off discount at the Garden Shop and a $5 discount on Botanic Garden memberships will be available May 20 only. Remember: you must have a Glencoe Public Library card to take advantage of this special event. If you do not have a card, be sure to obtain one at the Checkout Desk before May 20. As one of America's great Pop artists, Roy Lichtenstein produced some of the most iconic images of the 1960s. If you're a fan, you'll want to come to the library on May 17 at 7:00pm when Art Historian Jeff Mishur returns to present Whaam! 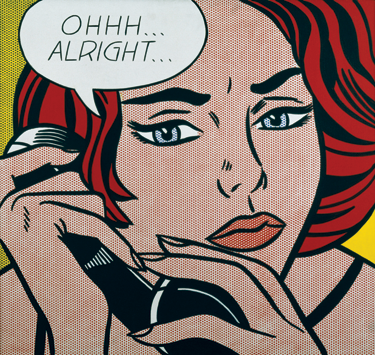 : The Art of Roy Lichtenstein: An Exhibition Preview. Jeff will discuss selections from Lichtenstein's career including a number of works that will be included in the retrospective at the Art Institute of Chicago, to be mounted from May 16 to September 3, 2012. Mishur will also position Pop Art within the larger context of Post-World War II material culture.